Cruise control works by monitoring your car’s speed and then adjusting the throttle inputs to keep it at the same speed. It’s usually only accurate to within 3-5kph so it’s not a good idea to set it to 107kph because you may exceed the police’s tolerance level. To maintain the set speed, the engine has to fight against wind resistance, inclines, and the rolling resistance of the tires. Therefore when driving, the engine is always working because there’s always something pushing against the car. Unless you are driving on a sufficiently steep downhill gradient, in which case gravity takes over and you will speed up even with no throttle input. Increment/decrement – you can add or subtract usually 1, 5 or 10kph to the speed, depending on the system and options. Radar distance – if you have radar cruise control (also called adaptive cruise control) there are usually three distances, approximately 1, 2 and 3 seconds behind the vehicle in front, and the system will attempt to keep you at that distance, matching the speed of the vehicle you are following Some systems also have a speed limiter or a warning if you exceed the local speed limit. The answer is both yes and no. No, but only if you have traction control and electronic stability control enabled in your vehicle. Ice, slush and snow is a different matter because you shouldn’t be travelling fast enough to warrant using cruise control and many vehicles don’t let you set cruise control at less than around 30kph. 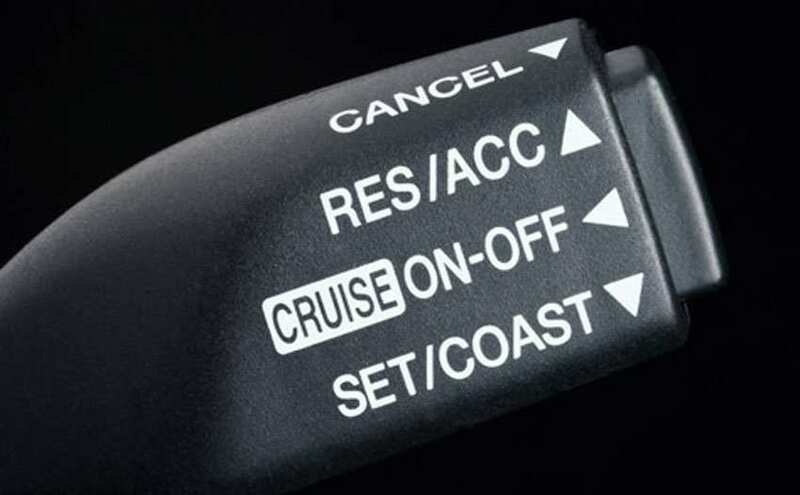 If you do not have traction control or stability control then yes, cruise control is dangerous in heavier rain or where there is standing water. Cruise control systems on older cars (or cheaper new cars) will continue to apply more power if it detects that it needs more power to maintain a particular speed. What makes this dangerous in the wet is aquaplaning (or hydroplaning). Aquaplaning is where your wheels ride up on a cushion of water, essentially sliding over the surface of the water, because the tread in the tires is not deep enough to disperse the water fast enough. Therefore, when you are aquaplaning, you have very little grip and any acceleration applied to the engine may be able to make the tires spin faster more easily. In the case of aquaplaning, the wheels spin which raises the pitch of the engine, making it seem like you are going faster even though you’re not. Since you have lost traction at that point, it’s easy to leave the road and crash. If you do get into a skid, do you know what to do? Advice given in the Road Code for correcting skids is now outdated and dangerous. Find out why by checking out this.